Lets talk cake smash photos. 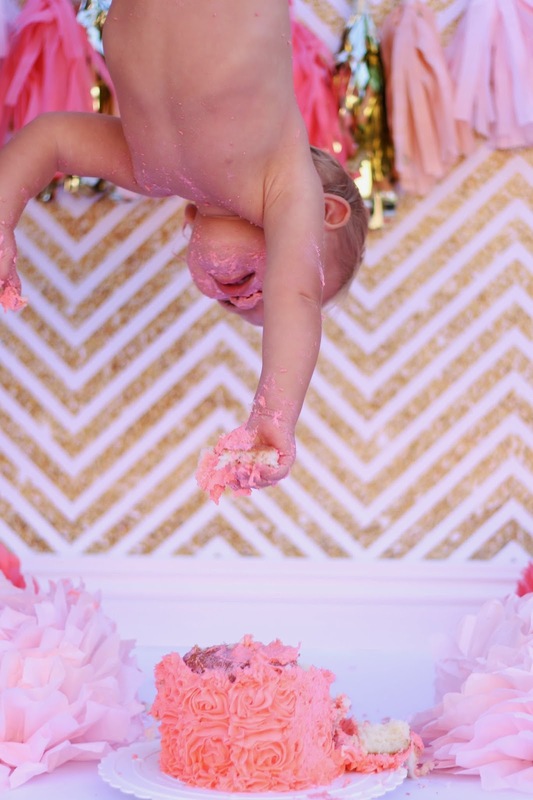 We have all seen them: cute little babies diving into their own personal-sized cake for their first birthday. 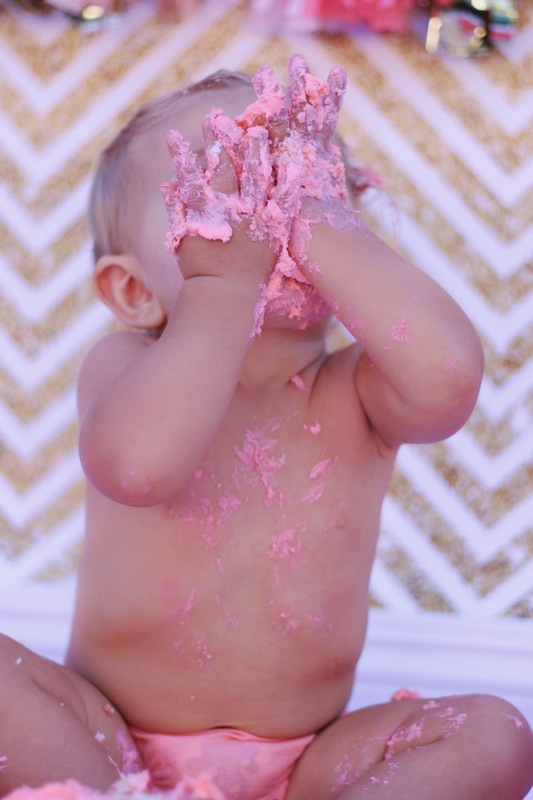 I think taking cake smash photos is a wonderful way to document baby's first birthday. That being said, I don't think you need to spend an arm and a leg on a professional photographer for them. In fact, I KNOW you don't. 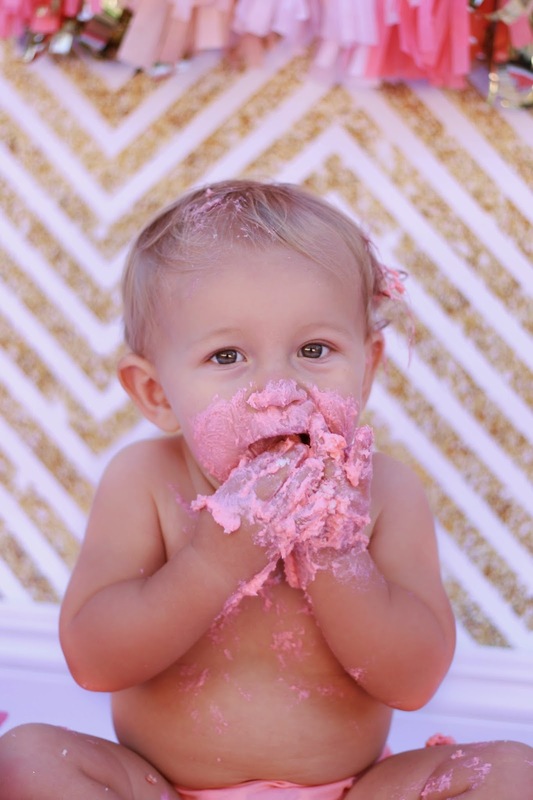 I took my own cake smash photos of Henley and I am thrilled with how they turned out. I made everything for her shoot as well, and I will tell you all about it! In a room in your home that has the most natural light possible, choose a wall that is well lit, but doesn't have bright sunlight shining directly on it. This is where you will tape up your backdrop and set up. If your house is not well-lit, like mine, take to the outdoors and pick a nice shady spot. 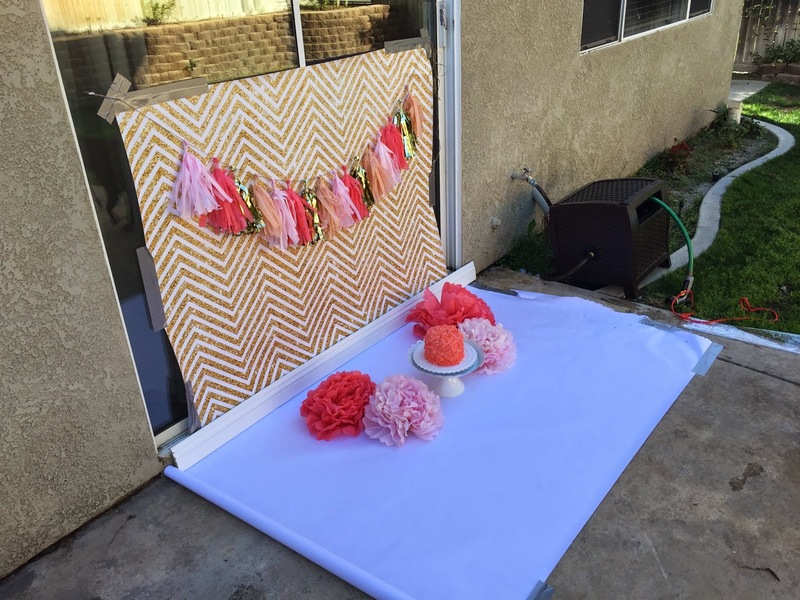 I set up our cake smash in my backyard and taped the backdrop to our sliding glass door. 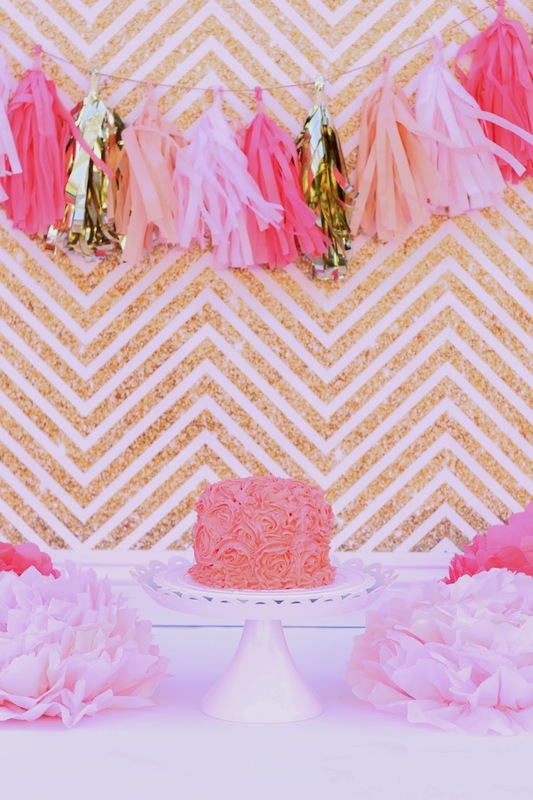 Backdrop: I bought a vinyl backdrop off of Etsy from Bubblegum Backdrops. There was a sale going on at the time, so for a 4'x5' backdrop, I paid $48. I plan on using it again, for photos or for party decor, so I was willing to spend the money on it. You could also buy patterned wrapping paper of your choice or a solid roll of paper for the backdrop for an inexpensive backdrop option. Flooring: You will also need a solid roll of white paper for the flooring. I think that white looks best and works best for lighting. They sell large rolls of white paper at craft stores (I bought mine at Hobby Lobby with a coupon and spent about $5). 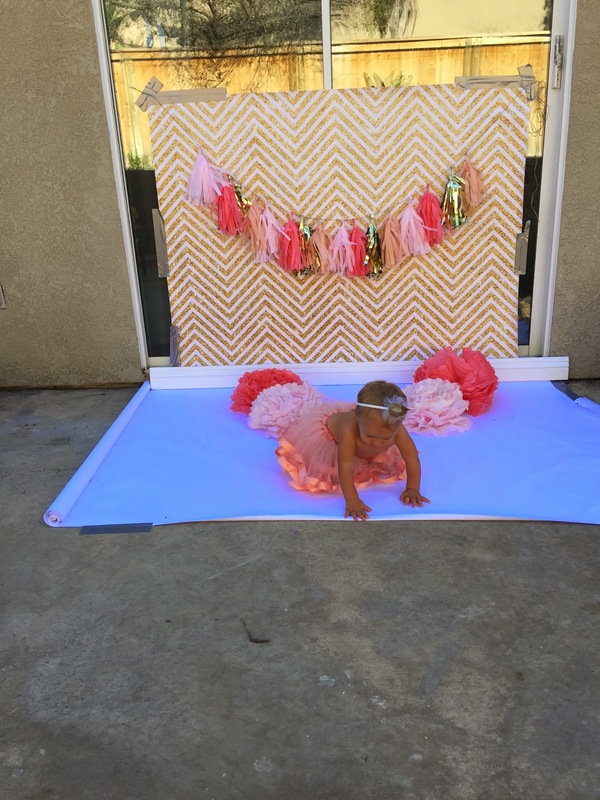 You can buy one large roll of solid white paper to use as a seamless backdrop and flooring. Just tape one end of the roll at the top of where you want the backdrop to start and roll it all the way down and onto the floor. Baseboard: To look as professional as possible, I bought a 5 ft long white baseboard from Home Depot to camouflage the seam between the backdrop and paper flooring. This is optional, but for a few bucks, it really makes a difference! 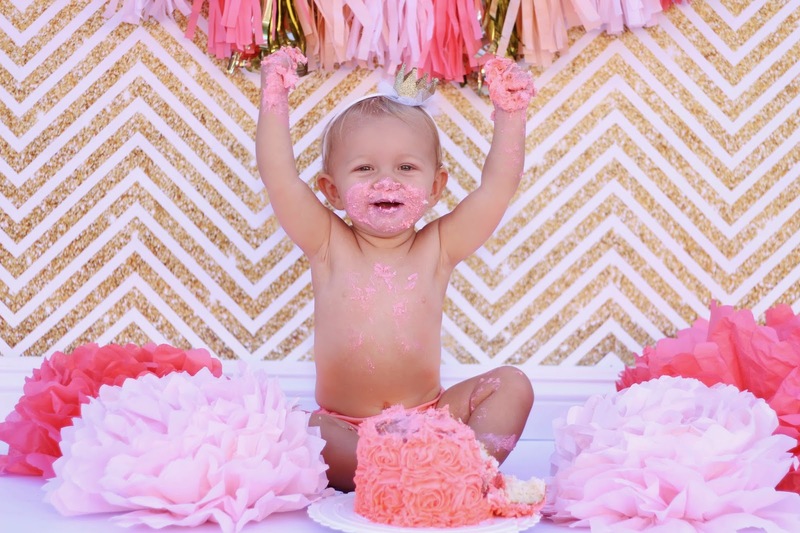 Decorations: I made a tissue banner and some tissue poms in pink, coral, and gold to coordinate with the color scheme for Henley's birthday party, because I was planning on displaying the cake smash photos there. I made Henley's cake for her cake smash following these directions I found on One Little Project. It worked perfectly and was the best looking cake I have ever made! 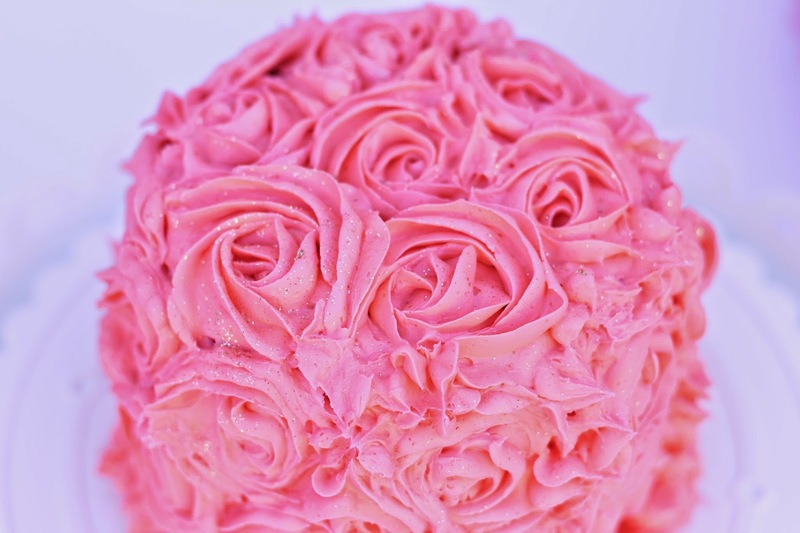 I came terrible at frosting desserts and it was surprisingly easy to do. It only cost me maybe $20 for everything because I cheated and bought a tub of decorator's frosting at Michael's. I also bought edible gold glitter for $5 to sprinkle on top. You can also buy a cake from your local grocery store. I was at Albertson's the other day and they had mini cakes specifically for cake smashes/first birthdays for around $10. 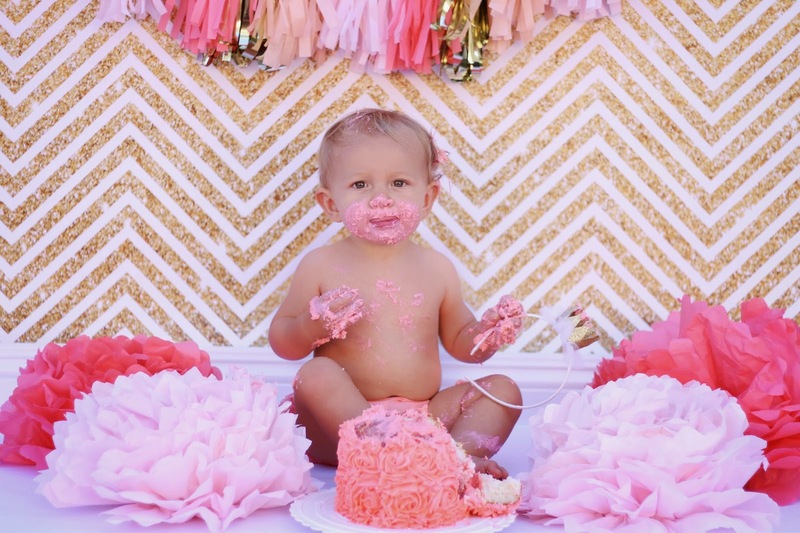 Remember that your little one is going to be covered in cake and frosting and that is the purpose of these photos. That being said, less is more. 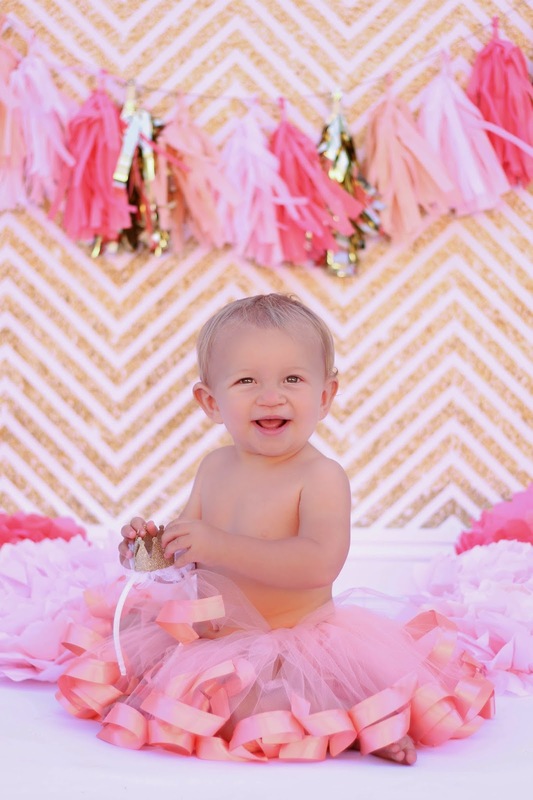 For girls, great ideas would be: ruffled bloomers, a romper, or a tutu. 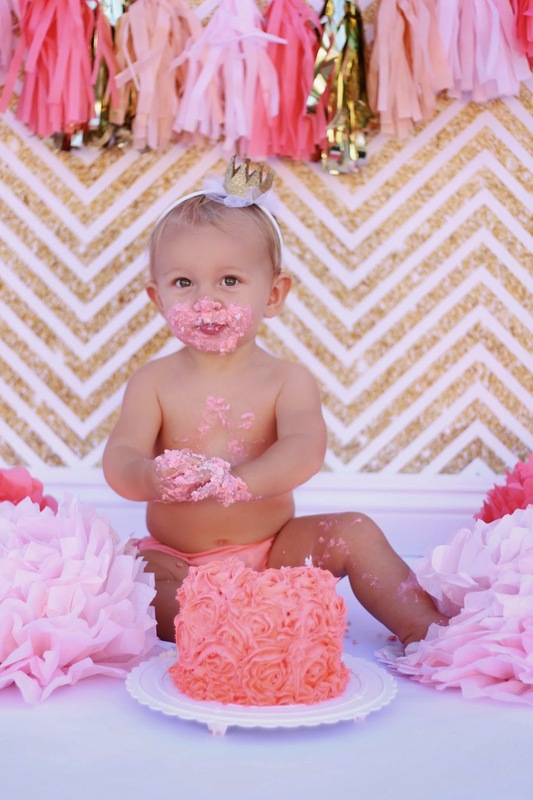 Accessories like a crown, headband, or chunky baby jewelry look great too! 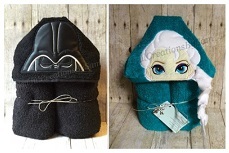 For boys: a solid diaper cover, pants, or plain onesie. You could also have them wear a tie, bowtie, suspenders, or party hat! I made Henley's ribbon-trimmed tutu (tutorial to come soon) and had her wear a crown headband that I found at Target. I took a few pictures of her without the cake in her tutu and then changed her into ruffled bloomers that I didn't mind getting icing on. Take these photos when you have a helper around. I made sure to pick a day my husband would be home to help set up, manage Henley while I took photos, and to help with clean up. Make sure to set up and have everything ready to go before you get your baby ready. Take a few pics of the cake with the backdrop too! Test out the lighting and play with the settings on your camera to make sure that everything is just right. 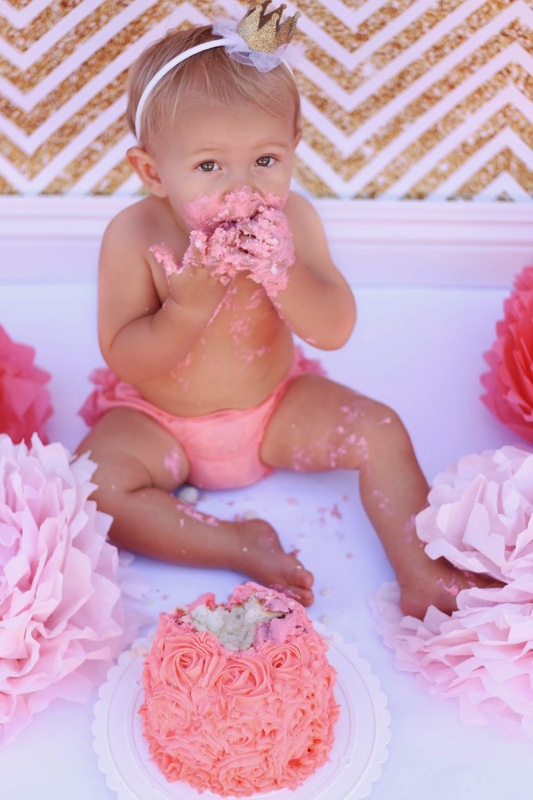 Get some photos of baby without the cake first...some pretty "before" shots, if you will. Then, have your helper set the cake down in front of baby and point, aim, shoot! Take pics from a variety of angles, distances, etc. Realistically, you have a few minutes before the babes get over it. Have fun with it! 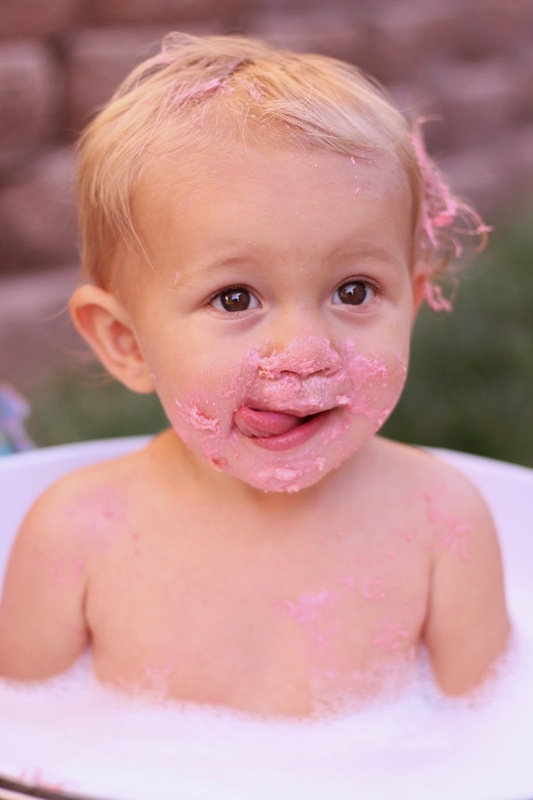 Have a tub ready to go...your little one will be messy! Take some pics to document the clean up, too. 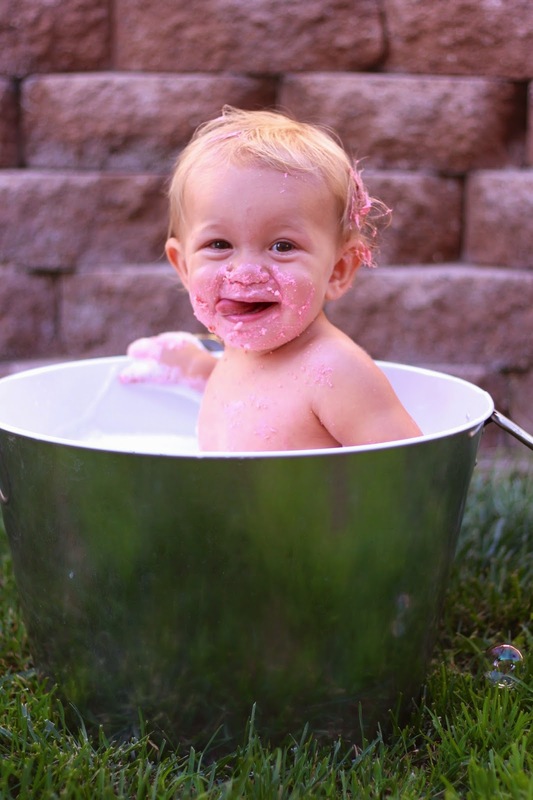 We have a galvanized metal tub that we filled with warm water and bubbles in the yard to wash up in after the smash and it worked out great and made for some cute photos. There you have it! 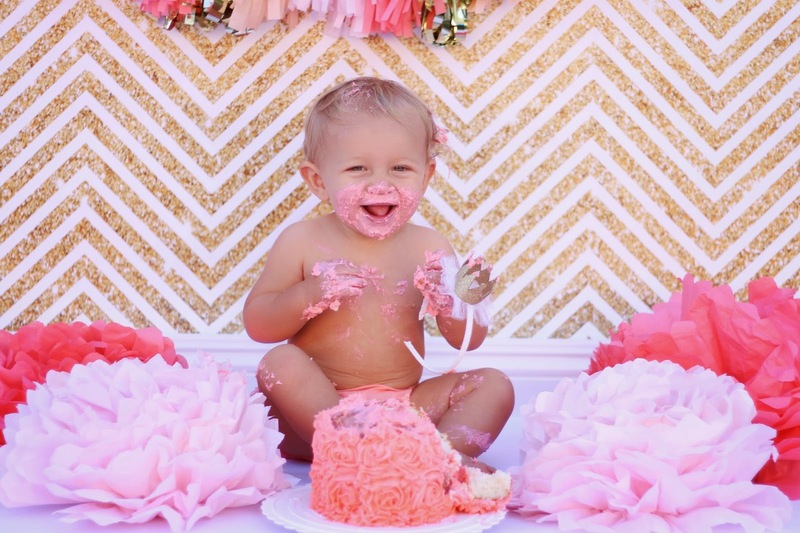 I know that some people spend hundreds of dollars on professional cake smash sessions, but you do NOT need to spend a fortune on these pics. After all was said and done, I spent about $120 for everything (backdrop, decor, cake, outfit, and prints of the photos), however, you could easily spend under $50 and still get great photos! 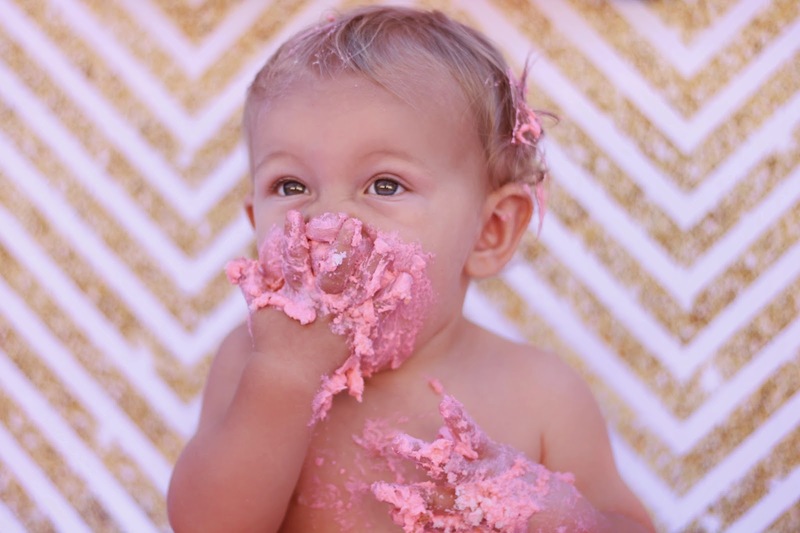 I hope this helps and gives you some idea as to how to do your own cake smash photos. P.S. 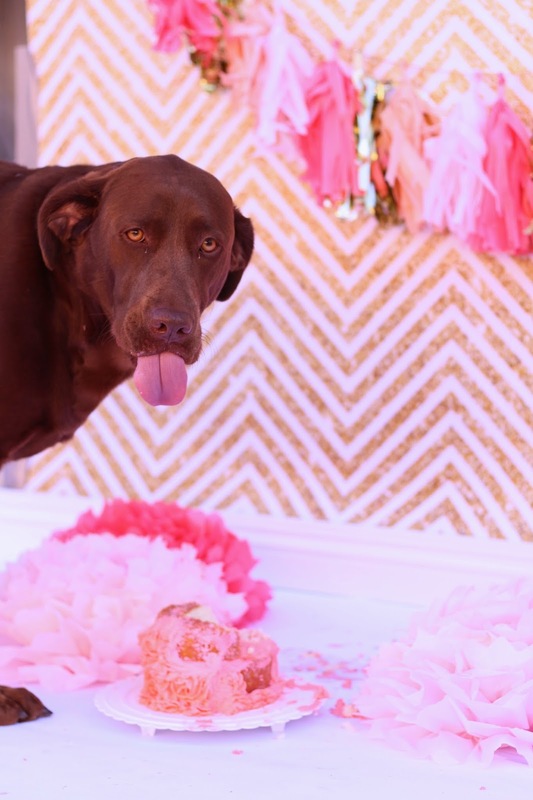 If you have a dog, you may want to treat them to the leftovers, like we did with Reese! Ha!